Little or none for annual asters. Many perennial asters are very cold hardy. Encourage fast growth by mixing a balanced organic fertiliser into the soil before planting. Take care not to overfeed China asters, which may not bloom well when given too much nitrogen. Zinnia and Sunflower. Use China asters as feature plants for the late summer garden, but do not crowd them. When starting China aster seeds indoors in early spring, cover them well with moist seed starting mix. 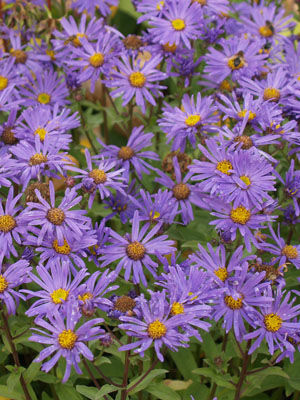 China asters also can be direct-sown in late spring, after the soil has warmed. Providing some type of grow-through support for China asters helps to keep the plants upright in late summer, when they become heavy with blooms. Blossom colours include pink, purple, lavender, white, and red. Gather China asters for flower arrangements when the blooms are just beginning to open. When kept in fresh water, new petals will unfold for two weeks. Leafhoppers spread disease among asters. Where this is a problem, cover plants with horticultural fleece during the first half of the growing season.